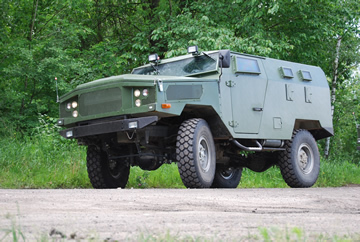 The Polish Tur Light Protected Patrol Vehicle is another vehicle to be developed by the Polish manufacturer of specialist type vehicles, AMZ for the purpose of transporting 5 soldiers. 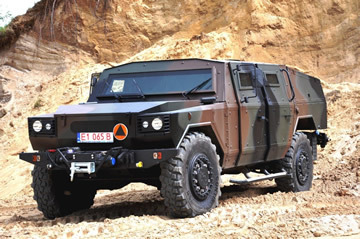 Though it has a high level of protection it falls under the category of a Modern Light Protected Patrol Vehicle and meets Level 2 STANAG 4569 protection. It is designed as a safer and more modern alternative to the Humvee operated by the Polish Army in the former operations in the later years of the Invasion or Iraq and the ongoing operations in Afghanistan. However as of 2009, the Polish Army nor any other has purchased the vehicle. synchronized 6-gears + rear gear, permanent 4 wheel drive Transmission and transfer box which allows to use of 24 shifts : 12 to standard roads and 12 to off road drive. Wheel track – 1700 mm. Height – 2350 mm. / 2770 mm. Total width – 2230 mm.